The staff were so helpful and pleasant in accommodating us. Prompt and courteous to our needs. Our family enjoyed our stay looking on to our next family get together real soon. The home was beautiful, we enjoyed our stay very much. Angela was very helpful and friendly. Our communication was always on the phone, but she made me feel like a valued customer. I was a little anxious about staying at a property unseen, but my condo was very nice, clean, and it was a plus to be on the ground floor. I had very helpful neighbors, too. Guest book needs to be updated: The Wifi codes are barely legible and trash collection procedures are missing / confusing. Visiting Orlando is always a turnoff when our first experience is having to deal with the absurd toll roads. It's impossible to believe the tax base from the parks doesn't support infrastructure. Like the property close to all Orlando's parks. Very obliging and polite and friendly. When I checked in on Saturday March 28, 2015 around 4:30p.m. the lady "front desk worker" (Regal Palms staff, not Paradise Properties) could have been nicer to me. It could have been because they were busy during this time. However, I did notice that the other front desk workers were much nicer to their guests. Our second year staying at the Paradise Property was very comfortable as the first. . Always found linens and etc clean. Plenty of dishes and etc..glasses and utensils. No problem with insects because of well maintained in spraying. We would recommend this property to anyone with no hesitation. We were a little confused with check in procedure, was not clear in email. Darren has always helped us when we had a problem with the rental in 2014and dealt with it promptly. no problems this time! we enjoy Regal Palms and although it is sometimes too crowded in the hot tub and lazy river, we enjoy the resort. 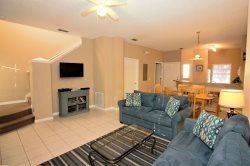 The house, although an 8 minute walk from the pool, is clean, big and a great home away from home! We enjoyed our stay and the house was very well furnished with kitchen needs and beds were comfortable as was living room furniture. As I mentioned above, we had and have always had excellent experience with all of your team members. You can tell that this team works well with each other. Other than what was mentioned above, we had a great time and we cannot wait for next year. Paradise Properties was a gold mine of a find 4 years ago and we keep coming back because of Sherry, Darren and the rest of the team. We are always treated with the utmost respect. I cannot say enough about them. They are truly a PROFESSIONAL group. Everybody we delt with was very friendly. Espscially Angela when I first checked about the property by phone before we rented.